Donate items to support us! 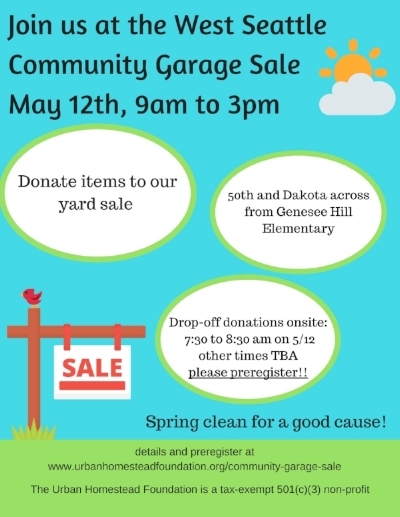 Please register below if you plan to bring items to our spot at the West Seattle community garage sale on May 12th. All proceeds from sold items will go towards the purchase of the Dakota Homestead at 50th and Dakota. Any unsold items will be donated to goodwill. We will not accept mattresses or large appliances. Thank you for participating on our garage sale and supporting the Dakota Homestead purchase!